What Day Of The Week Is September 16? 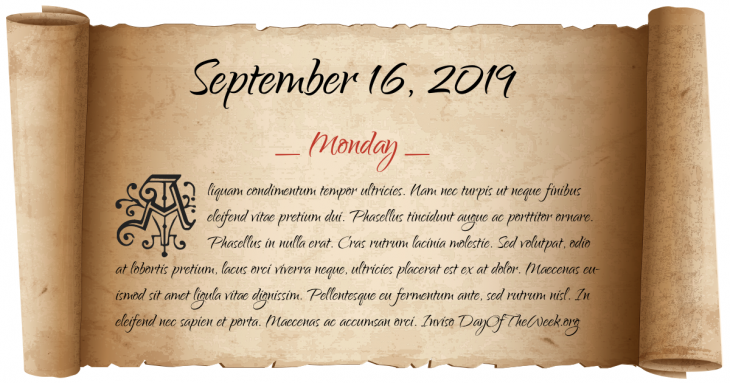 September 16, 2019 is the 259th day of the year 2019 in the Gregorian calendar. There are 106 days remaining until the end of the year. The day of the week is Monday. The Fire of Moscow (1812) begins shortly after midnight and destroys three quarters of the city days later. Settlers make a land run for prime land in the Cherokee Strip in Oklahoma. Mercenaries working for Blackwater Worldwide allegedly shoot and kill 17 Iraqi civilians in Nisour Square, Baghdad; all criminal charges against them are later dismissed, sparking outrage in the Arab world. Who were born on September 16?